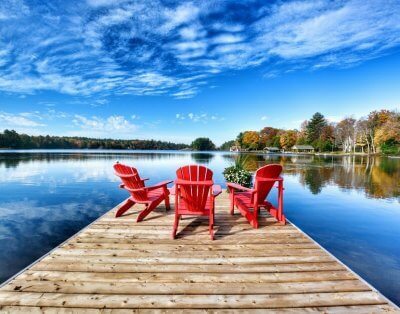 Enjoy classic Muskoka cottaging on Lake Muskoka – there’s room for your extended family to enjoy a vacation together! This versatile property includes a main cottage, guest cabin and boathouse and two docks. CRESTFIELD is located between Bala and Port Carling, on Lake Muskoka, only a short 1 ½ hours from Toronto. With easy access from the highway and conveniently situated between Bala and Port Carling, there’s lots to enjoy nearby: golfing, shopping, dining, farmers markets. 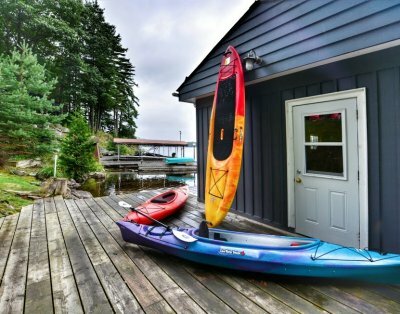 Enjoy the stunning beauty of CRESTFIELD with its naturally windswept landscape atop a plateau of granite, and 315 feet of shoreline with a magnificent panoramic view of the lake and islands – Muskoka paradise found! This wooded property is a fabulous family compound, completely private and secluded, on its own point of land. Extraordinary privacy from the neighbors on both sides! There is a gentle walking path down to the new boathouse on one side of the point, a second path down to your own private dock, and yet another third path to a small cove. Natural shallow water entry and deeper water off the end of the dock/boathouse make for great swimming and other watersports. Two kayaks and a canoe are provided so you can explore the shoreline and bays. The cottage road is ideal for walking, running and cycling. The kids will have a blast with the trampoline on the grassy side yard! The other walkout takes you into the Muskoka Room where there is space for everyone – seating for 10 – including 2 corner hammocks! Enjoy the peace and solitude in this beautiful screened porch and take in the panoramic views of the lake and property. Nostalgia at its finest! Back inside, the living room has comfy sofas and a TV with DVD player for family movie night. Or if you are planning a family game night there’s a great selection of games and puzzles. A cozy wood stove will take the dampness out of a rainy day.